The extended solar minimum conditions in 2008 and 2009 presented an opportunity to investigate the ionosphere at lower solar activity levels than previously observed. The Coupled Ion Neutral Dynamics Investigation (CINDI) Ion Velocity Meter (IVM) instrument onboard the Communication/Navigation Outage Forecasting System is used to construct the median meridional (vertical) ion drifts, ion densities, and O+ concentrations during periods of low geomagnetic activity for four characteristic seasons each year spanning late 2008 to 2010. The presence of a large semidiurnal component in the ion drift variation at the equator produced significant differences from typical ionospheric conditions. Instead of upward drifts during the day and downward drifts at night, downward drifts in the afternoon and upward drifts near midnight are observed. This semidiurnal component is present in all seasons though it is strongest during the solstice seasons. It is shown that upward drifts at night correspond to regions with a high occurrence of postmidnight irregularities during the December 2008 and June 2009 solstices. A comparison with vertical ion drifts observed by the Jicamarca Radio Observatory supports the methodology used to extract meridional drifts from the IVM. 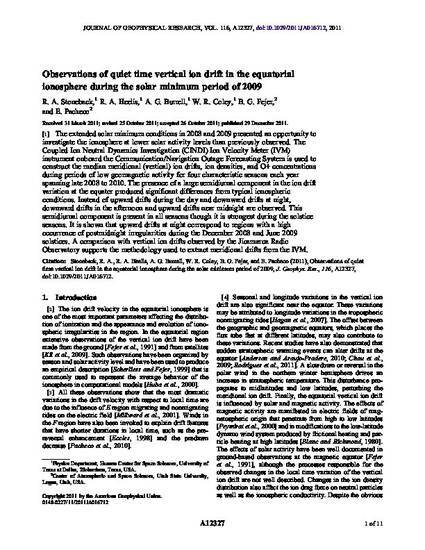 Stoneback, R. A., R. A. Heelis, A. G. Burrell, W. R. Coley, B. G. Fejer, and E. Pacheco, Observations of the vertical ion drift in the equatorial ionosphere during the solar minimum period of 2009, J. Geophys. Res., 116, A12327, doi:10.1029/2011JA016712, 2011.